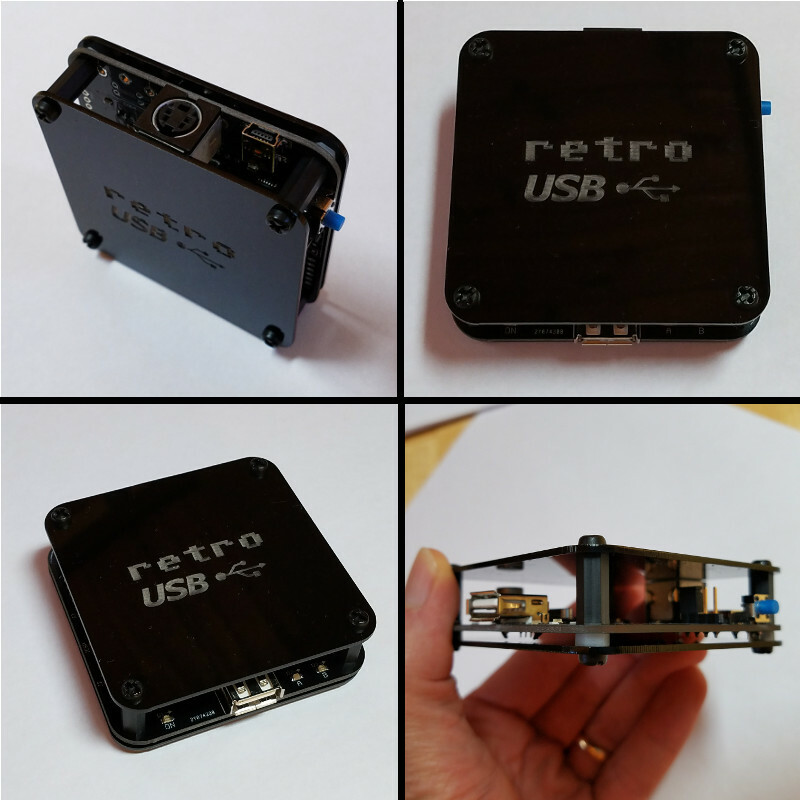 Some good news for Retro USB this week: new hardware, international keyboard improvements, and an enclosure prototype! Everything is maturing nicely, thanks to feedback and assistance from some helpful early adopters. More hardware is available, if you haven’t yet gotten yours. Forward ho! For anybody who’s newly tuning in, Retro USB is an input converter for USB and ADB keyboards and mice. It works in two directions, connecting modern USB peripherals to a classic ADB-based Macintosh or Apple IIgs computer, or ADB peripherals to a USB-based computer running Windows, OSX, or Linux. After a slightly bumpy start, I’ve finally perfected the PCB design with version 1.2. This is the first version whose assembly won’t require me to apply manual fix-ups for my design mistakes, so the assembly process can be simpler and faster. It doesn’t make any difference to the final product, but hand-soldering patch wires and extra resistors is tiresome work. I’m very glad to be rid of that job. The most significant change in board version 1.2 is the addition of a 1000 uF bulk capacitor for the USB power supply. This enables Retro USB to handle brief spikes in power demand from attached devices, such as the spikes from an Apple A1243 keyboard during its initialization. With this capacitor, there are no problems with “spiky” USB devices like the A1243. The built-in hub on the A1243 works too, and is a convenient spot to attach the mouse. A bulk capacitor can be retrofit to board versions 1.0 and 1.1, if you’re comfortable with some basic soldering. You’ll need a capacitor of 680 uF or more, with a voltage rating of 6.0 volts or more, like this example. Solder the capacitor’s negative terminal to the board’s GND and the capacitor’s positive terminal to the board’s VUSB. See the photos for the board locations to use. Firmware version 0.1.15 resolves a few remaining issues for non-US keyboards, and layouts from French to Danish to Estonian and everything in between should now be working, in both USB-to-ADB and ADB-to-USB directions. Please see the International Keyboards section on the main Retro USB page for important details. 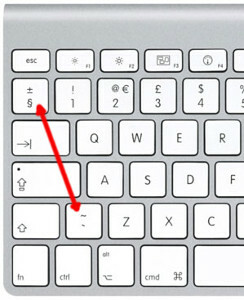 For many countries outside the USA, the USB keyboards designed for Windows PCs have a different layout than Apple keyboards. These PC-type USB keyboards may be used, but key mappings for some symbols will be incorrect where differences exist between the Apple and PC-type layouts. Best results will be obtained with Apple-brand non-US keyboards, or any brand US-layout keyboards. I’m working on a simple enclosure to protect the Retro USB board and add a touch of style. It’s gloss black 1.5 mm acrylic with an engraved logo, and cut to the same shape as the PCB. Add a few spacers and screws, and it makes a nice little package that’s easy to assemble. Initially I’d planned to make a fully-enclosed 6-sided box, but I would have needed to lose the rounded corners, and my experience with the Floppy Emu enclosure has taught me that 6-sided laser-cut enclosures can be awkward to put together. I quite like the appearance and simplicity of this enclosure, and it will probably show up in the store soon. Although the start was a little chaotic, Retro USB’s software and hardware now are both looking good, and the device can truly deliver on its plug-and-go promise for ADB and USB conversion. On the software side I’ll be looking at multi-button mouse support soon, so stay tuned for that. For the hardware, most of the effort will go into improving the assembly and testing process, and transitioning away from hand assembly. After that, we will see what else takes shape! I received a large number of new Retro USB PCBs today, which include a few small component changes from the 1.0 design. Bad news: I blundered by reversing the gate and drain connections on the MOSFETs used for level conversion. DOH!! Always read the datasheet carefully, boys and girls. On a 3-pin device, I must have assumed the gate would be the pin on the side by itself, with drain and source paired up on the other side, just like the canonical drawing of a transistor. Unfortunately that’s not true here. Hopefully I can find another brand of SOT-23 N-channel MOSFET whose pins are organized the way I thought they should be, or else this whole pile of PCBs is going into the trash. For a moment I thought maybe I could rotate the MOSFET 120 degrees, or even mount it upside down, but I don’t think any soldering tricks can save me. Added support for ISO keyboards, commonly used outside the USA. This should fix the key mapping for the ^ or @ key (the key to the left of 1) and the <> key (the key to the right of the left shift). Mostly untested since I don’t have any ISO keyboards. The keymap type is automatically set to ISO at startup if an Apple-brand ISO keyboard is detected (untested). If you have a non-Apple ISO keyboard, you’ll need to switch to ISO manually with Ctrl-Shift-Capslock-T.
Single-function USB devices are now prioritized over composite devices. Prevents a mouse with a keyboard macro feature from usurping the role of keyboard. Disabled HID report descriptor parser’s error check for report items with count = 0. Some real USB devices do this, like the Logitech RX 250 mouse. If you have an ISO keyboard, and you’ve previously used Retro USB with firmware earlier than 0.1.8 on an OSX Mac, you’ll need to delete the OSX keyboard preferences to make it “forget” Retro USB. Delete the file /Library/Preferences/com.apple.keyboardtype.plist, then restart. If you don’t do this, your key mappings may be incorrect. 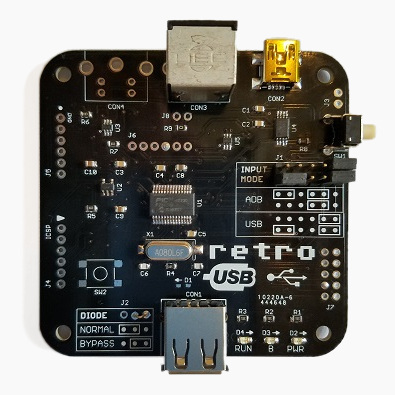 Retro USB is an input converter for USB and ADB keyboards and mice. It works in two directions, connecting modern USB peripherals to a classic ADB-based Macintosh or Apple IIgs computer, or ADB peripherals to a USB-based computer running Windows, OSX, or Linux. The foreign keyboards and mice behave exactly like native peripherals, requiring no special software or drivers – just plug it in and go. I received a couple of reports that Retro USB doesn’t work correctly with the Apple Aluminum Keyboard, model A1243 and its smaller sibling A1242. This is Apple’s standard wired USB keyboard, so it’s fairly common. The A1243 has an integrated hub with two USB ports for other devices. I don’t have one myself, but I was able to borrow an A1243 from a neighbor so I could take a look. What I found was not good. During the USB enumeration process, there’s a huge voltage sag on the VUSB +5V supply. This is true whether VUSB is fed from the Macintosh’s ADB +5V supply, or from an external 5V supply. During USB enumeration, VUSB abruptly drops from 5V down to about 2.7V over a period of half a millisecond. Then it recovers, drops again, and repeats the process three or four times. Meanwhile the microcontroller starts reporting USB “bus turnaround” errors. Eventually the voltage bouncing stops after about 6 ms, but the keyboard never enumerates successfully. At first I thought this was a simple problem: I just needed a bigger capacitor on VUSB. When the A1243 enumerates, it must switch on some internal power-hungry circuit that momentarily draws a lot of current, dragging down VUSB. 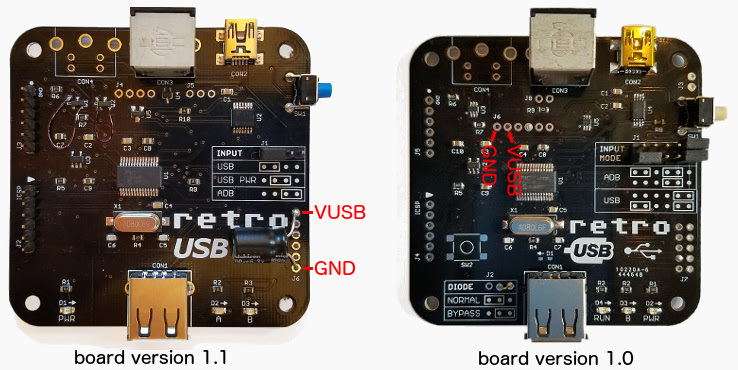 The Retro USB board has a single 10 uF ceramic capacitor on the +5V USB supply. But when I tried larger capacitors up to 220 uF, they barely made a dent in the degree of voltage sag. With the 220 uF cap, the voltage sags bottomed out at 3.4V instead of 2.7V, but I still got lots of USB errors and failure to enumerate. 220 uF is already a jumbo-sized capacitor, and I can’t imagine fitting something even larger on the Retro USB PCB. My second thought was to add an inline inductor between the VUSB supply and the USB connector. That would prevent too much current from being drawn all at once. I only had a single suitable inductor on on hand, with an uncertain value: the bag said 22uH, but the component was labeled 223 which I believe means 22mH. At any rate, it didn’t help much, and VUSB still sagged down to 3.2V while the keyboard failed to enumerate. With failures of both the capacitor and inductor techniques, I’m out of other ideas for ways I can minimize or eliminate this VUSB sag. But wait, there’s more to this mystery. The A1243 actually enumerates OK, with no VUSB sag at all, if nothing is connected to its USB ports. It’s only when a mouse or a flash drive is connected to the A1243 that the big voltage sag occurs. And these same mice and flash drives don’t cause any voltage sag when they’re connected through a different unpowered hub. I’ve come to the conclusion that the A1243 contains a big capacitor that only gets charged during USB enumeration, and only if something is connected to one of its hub ports, so that the hub function is enabled. I was sometimes able to get the A1243 with an attached mouse to enumerate successfully, if I powered the Retro USB board from an external 5V supply instead of the Macintosh ADB 5V supply. The same degree of voltage sag was still there, so I’m not even sure why it worked, and success seemed to depend on exactly which mouse I tried. 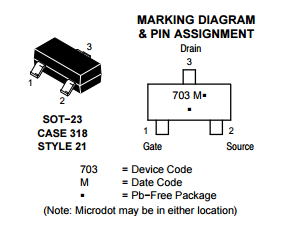 The A1243 also causes problems in other scenarios, even where no voltage sag is observed. It works OK when it’s connected through a separate unpowered hub. But if a mouse is also connected to that same hub, there’s no voltage sag, but there are large numbers of USB errors and none of the devices ever enumerate successfully. There’s clearly something strange about the A1243’s power requirements, as evidenced by this Apple forum thread full of complaints. A hundred people all agree that their computer wasn’t recognizing their A1243 anymore, until they used the USB extension cable that’s bundled with the keyboard, then it magically began working again. A few people said a 3rd-party USB extension cable also solved their problems. It sounds bizarre, but if the extension cable is acting as a small source of additional inductance and capacitance, I could imagine it having a beneficial effect. However, when I tried using the extension cable with Retro USB and the A1243, the voltage sag was still just as bad and the problems remained. If the A1243 weren’t such a common keyboard, I’d simply write it off as an unknown incompatibility. But given how common this keyboard is, I really want to find a way to make it work. LED A now illuminates when there’s a working ADB or USB connection to the host computer. LED B blinks when there’s keyboard or mouse activity. F13 now functions as an ADB power key in standby mode, just like PRINT SCREEN. Some USB keyboards don’t have a PRINT SCREEN key, some don’t have F13, so you can’t please everybody. Special ADB keycodes for the right-side shift, control, and alt keys are no longer sent unless the host computer specifically requests them. This fixes some weirdness with these keys on the Apple IIGS at the BASIC prompt. Retro USB is available for sale now – visit the BMOW shop to be the first kid on your block to get one! Retro USB is an input converter for USB and ADB keyboards and mice. It works in two directions, connecting modern USB peripherals to a classic ADB-based Macintosh or Apple IIgs computer, or ADB peripherals to a USB-based computer running Windows, OSX, or Linux. The foreign keyboards and mice behave exactly like native peripherals, requiring no special software or drivers – just plug it in and go. 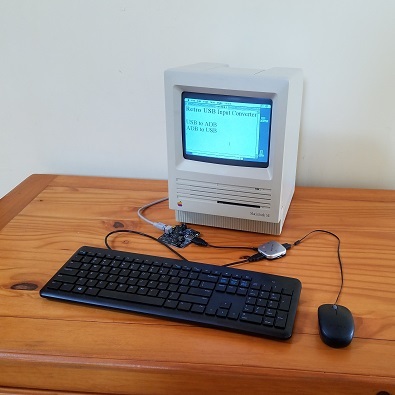 Now you can finally use an optical mouse with your vintage Macintosh, or amaze your coworkers with an antique Apple Extended Keyboard on your work machine. The last month of development has been a marathon, but I’m very excited to finally release this product whose first concept was outlined here over a year ago. Aside from a very long period of hibernation between concept and implementation, the final result turned out very similar to how I imagined it in those first concept posts. 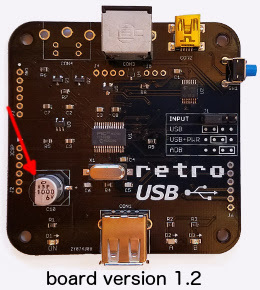 The Retro USB hardware is compatible with all Apple computers, keyboards, and mice using a mini DIN 4-pin ADB connector, including most early Macintosh computers and the Apple IIgs. It is also compatible with standard USB keyboards and mice with a USB-A connector. When in ADB-to-USB conversion mode, it works under Windows, OSX, Linux, or any other operating system that supports USB HID input peripherals.